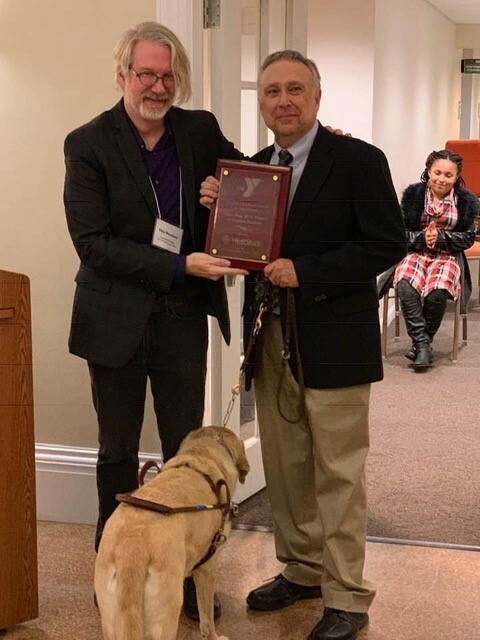 Stephen Kuusisto (right) with Phil Memmer, executive director of the Arts Branch of the YMCA of Greater Syracuse, and Corky. Two members of the Syracuse University community recently received awards at the 2018 YMCA Central New York (CNY) Book Awards. Christine Kitano G’10 and Stephen Kuusisto, University Professor, won the 2018 YMCA CNY Book Award for Poetry and Nonfiction, respectively. 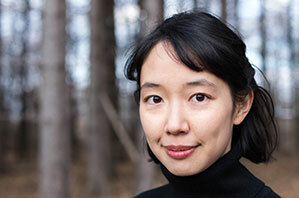 Kitano won for “Sky Country” (BOA Editions, 2017), her second collection of poetry, which draws on real and imagined immigration experiences of Kitano’s family to elicit an intense longing for home. Kitano’s grandmothers fled Korea and Japan, and her father was a Japanese American incarcerated during WWII. Kitano is a 2010 graduate of the Masters of Fine Arts program in creative writing in the College of Arts and Sciences. In addition to “Sky Country,” Kitano has authored “Birds of Paradise” (Lynx House Press, 2011). She is an assistant professor of creative writing, poetry, and Asian American literature at Ithaca College. Kuusisto won the 2018 YMCA CNY Book Award for Nonfiction with his memoir “Have Dog, Will Travel: A Poet’s Journey” (Simon & Schuster, 2018). The book portrays how the process of training for a guide dog and incorporating Corky—Kuusisto’s dog—into his life changed Kuusisto in major ways, spiritually and psychologically. In addition to “Have Dog, Will Travel,” Kuusisto has authored two previous memoirs—“Eavesdropping: A Memoir of Blindness and Listening” (W.W. Norton & Co., 2006) and “Planet of the Blind: A Memoir” (Random House, 1997)—and the poetry collections “Letters to Borges” (Copper Canyon Press, 2013) and “Only Bread, Only Light” (Copper Canyon Press, 2000). He is a professor of disability studies in the School of Education and previously served as director of The Renée Crown University Honors Program. As announced earlier this month, Kuusisto will be joining the Burton Blatt Institute to launch a new initiative, Interdisciplinary Programs and Outreach. Syracuse University had a strong showing in the nominee and finalist lists for the three award categories: fiction, poetry and nonfiction. Two of those finalists were Jonathan Dee, assistant professor of English, for “The Locals” (Random House, 2017) in the fiction category, and Sean M. Conrey, associate director of Project Advance and part-time assistant professor of English, for “The Book of Trees” (Saint Julian Press, 2017) in the poetry category.